WelcomeThe Kent State University Press welcomes inquiries and proposals in our fields of publication, listed below. 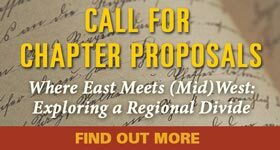 Please send a letter or email of inquiry briefly describing your project to Acquiring Editor Will Underwood, following which you may be invited to submit a proposal. Proposals should be sent digitally via email following the proposal guidelines on this page. The Press does not return unsolicited materials or accept unsolicited manuscripts. We do not publish fiction, except occasionally within our Literature & Medicine series. We do not publish poetry, except for the winners of the Wick Poetry Prize and Wick chapbook competitions and within our Literature & Medicine series. For your convenience, the Kent State University Press provides the following downloadable guidelines in PDF format. Note: Adobe’s Acrobat Reader software is required to view or print our submission guidelines. If you don’t have Acrobat Reader, you can download it for free here.